The Soil Pick is a selective excavator. Selective in the sense that it fractures, pulverizes and displaces porous and semi-porous soils, yet leaves nonporous objects unaffected. 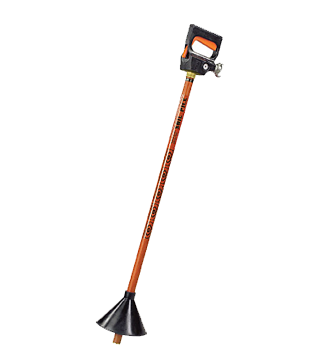 The Soil Pick excavates soil without risk of damaging buried utilities. The Soil Pick employs converging/diverging nozzle technology to accelerate compressed air to supersonic speed (to 1500 mph). The high velocity air stream travels approximately 4 inches from the distal end of the Soil Pick – ‘the cutting edge’ – before decompressing to atmospheric pressure with sufficient violence to pulverize and displace soil. Non-conductive, non-sparking tools are of obvious benefit to those working in environments that may be gas enriched and/or are in close proximity to live electric lines. 13, Taksim Alawkaf, Sawah Sq.